Don’t miss Granny Mouse Country House & Spa’s culinary artists Wayland Green and Theodasious Mannie at this year’s Decorex Durban show. 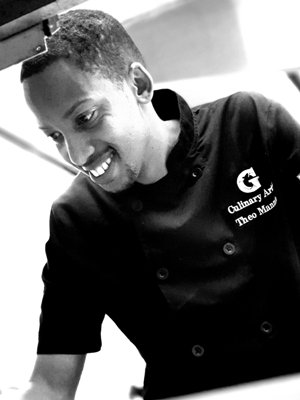 Originally from Glenwood in Durban, Green completed his studies in Food Preparation, French, Food Costing as well as Food Theory through the Hotel Training Academy from 2002 to 2004. He joined the Granny Mouse team in July 2015, has fast become a firm favourite with hotel guests as he designs incredible dishes, from start to finish, pleasing even the fussiest of palettes. He considers himself to be, “a very calm person, who works well under pressure and strives to push beyond his best” – but it’s his dishes that speak for themselves! Mannie, also a culinary artist and sous chef, joined the granny mouse family in 2017. He completed his studies at Canterbury College and gleaned plenty of invaluable experience from working in hotels, at food and music festivals, in canteens and even as a consultant assisting struggling kitchens turn their businesses around. Mannie’s true passion, however, is menu and dish planning. Catch the Granny Mouse team in action on Friday March 22 and Sunday March 24 at 17h00 – 17h50.